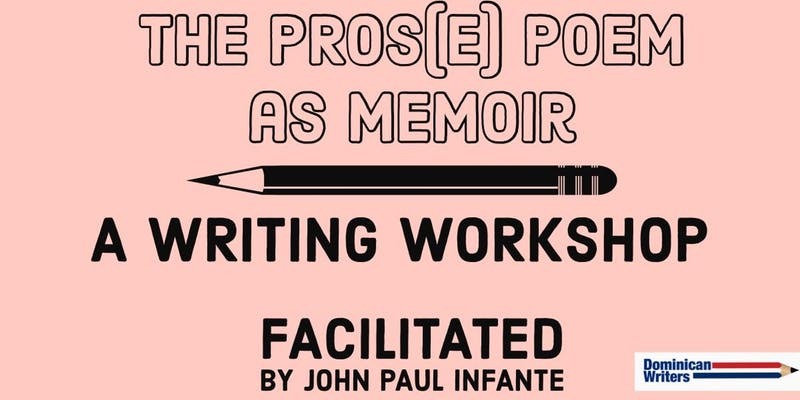 Register for John Paul Infante's "Pros[e] Poem as Memoir" writing workshop, organized by Dominican Writers, here: https://www.eventbrite.com/e/the-prose-poem-as-memoir-tickets-49568502726. In writing about our lives, we find ourselves looking back at who we were as if we were telling the story of someone else. Through small group discussions, in-class writing prompts, and co-participant feedback, this workshop attempts to have participants use their own personal experiences as inspiration. We will briefly (barely) go over the rules of poetry, prose and memoir and shatter them completely in order to get at the truth about who we are now and who were then. John Paul Infante is an award-winning writer and educator who has taught creative writing at Lehman College of the City University of New York and the humanities at the high school level in New York City. His poetry has been published in The Poetry Project, and fiction in Kweli Journal. His nonfiction won DTM magazine’s “Latino Identity in the US” essay contest. He lives in Washington Heights with his partner and daughter.